There are moments around this wonderful and crazy work that I do that deeply touch my heart. There are moments that remind me why I do this work. Yesterday, at the Salish Lodge, I had a great joy of officiating Mikey and Sam’s wedding ceremony. 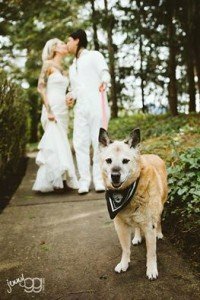 In attendance, as flower girl, ring bearer, wonder dog and best lady of honor, was Mikey and Sam’s beloved 16 and-a-half-year old dog, Sally. The love affair between Mikey, Sam and Sally is one of those inspiring stories that makes your heart happy. And the love shared by Mikey and Sam and all that brought them to their wedding day, is the stuff that reminds us all to love fiercely and to deeply appreciate life’s great gifts.